The settlement has likely been in existence since at least 1E 1167. In 2E 582, Bruma became neutral ground during the ongoing Alliance War, although it was initially within the territory controlled by the Daggerfall Covenant. The city was attacked by Dremora and Shadowed Path cultists in the name of Molag Bal. A Dark Anchor was then opened above the ruins of the city in an attempt to draw it into Coldharbour as part of the Planemeld, as well as to provide Daedric reinforcements. Several citizens barricaded themselves within key buildings, and the survivors sent pleas to both the Daggerfall Covenant and the Ebonheart Pact for aid. Passing soldiers helped the citizenry recover and fight back against the invaders, and the Dark Anchor was eventually lifted. In 3E 433, Bruma came under attack from the forces of Mehrunes Dagon. The Mythic Dawn planned to sack the city as they did Kvatch, by opening a Great Gate to the Deadlands and allowing a Daedric siege force to enter Nirn. These plans were discovered by the Blades, but were allowed to continue at the request of Martin Septim in order to obtain a Great Sigil Stone. Soldiers from the other cities of Cyrodiil flocked to Bruma to aid in the defense. 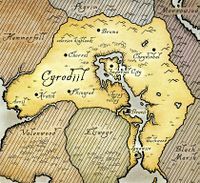 Rallied by Martin himself, the soldiers held back the tide of Daedra long enough for the Champion of Cyrodiil to enter the Deadlands and retrieve the Sigil Stone, ending the invasion. The Battle of Bruma became one of the most important conflicts of the Oblivion Crisis. That year, the Bruma Mages Guild branch was burned to the ground in a surprise attack from the Order of the Black Worm. This page was last modified on 10 November 2018, at 05:44.